Get ready for the main event with a camping pass for the whole weekend! 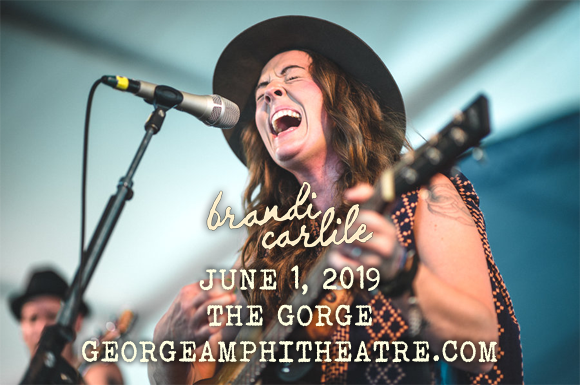 Brandi Carlile is coming to Gorge Amphitheatre on Friday 31st May 2019 and you can make the most out of the show by booking tickets to stay on the beautiful site… nothing beats being outdoors, hanging out with friends and listening to great music. Brandi Carlile is one not to be missed this coming Spring! Inspiring many right now on the folk music scene is the Grammy nominated American americana singer-songwriter, Brandi Carlile! After discovering that music was the sole thing that she wanted to do, Brandi dropped out of high school, to dedicate her life to playing Guitar/Piano and writing, recording and touring her own music. Since the beginning of her career, Carlile gained plenty of recognition and appreciation for her singles… such as the 2007 The Story, from the album of the same name, the record hit the big time and had a huge impact. In 2017, Gold has now sold 500,000 copies – paving the way for anything she now wants to do! Hence the release of her latest record, The Firewatcher's Daughter, following the footsteps of her previous releases, it was nominated for a Grammy for Best Americana Album and smashed the charts at no. 9 in Billboard 200! There's no surprise why Carlile is such a sensation as her sound combines all of the best bits of Pop, rock, alternative country, and folk. Brandi herself has quoted "I've gone through all sorts of vocal phases, from pop to blues to R&B, but no matter what I do, I just can't get the country and western out of my voice." And with her ability to sing and perform, she spreads messages such as activism campaigns and advocates for causes ranging from making awareness for health issues to women empowerment. Don't miss out on her LIVE concerts as she comes to a venue near you this Spring!